It's that time of the week again. The fabulous Weekend Rewind over at Life In A Pink Fibro. Last August I wrote this blog about blogging. Not too much has changed. I'm still trying to get into the groove of regular blogging and I'm still narcissistic about my stats and comments. I was hoping it would lessen, but I don't think it has. If you want to read the awesome comments I received first time round, you will need to click here for the original post. Thanks again Al - the weekend rewind ROCKS! I am reasonably new to blogging. Like Twitter, I started both around April this year. I have met so many bloggers through Twitter, and to be totally honest, I am somewhat intimidated at times. These people are good. Their posts sing. I love reading them and connecting with them. I am in awe of their ability to write an interesting post almost daily. I haven't been able to master that yet. I might get two done in a week and I think on the odd occasion I have written three. But daily? I'm not sure I have anything interesting enough to say that would make people visit my blog each day. Blogging has opened up a whole new world for me. I am finally able to write and have other people read my writing. That feels good. One thing I have learned is that I love sharing my writing with others. I love seeing my blog stats go up. I love comments. I love comments particularly when someone tells me my post has helped them, or it resonated with them. This is what makes my heart sing. For as long as I can remember I have written. Mostly my thoughts. When I'm at my angsty best I can write pages and pages of words pouring directly from my heart. When I read them years later I can almost feel my heart bleeding onto the page. I sometimes don't believe they are words that I've written. But they are. It is my handwriting after all. The scary thing I find with writing is that it brings out some narcissistic traits that I wasn't aware I had. I become obsessed with people reading my writing. I constantly check my blog stats. I mean constantly. I become frantic, constantly hitting the refresh key. I hope other bloggers do this, because if they don't I'm definitely in serious need of a life, or medication! I also hope I grow out of this habit. The constant refreshing ... not the medication habit. I like that one. I want my readers to comment. I love hearing people telling me that my post meant something to them. When someone tells me my writing is good my tummy literally tingles. The very beautiful Lisa Reynolds told me my writing was like and old friend. That gave me a glow that stayed with me for days. On the other hand, if my comment count is low I start to feel that perhaps I am a bad writer. That my posts don't move my readers enough to write a comment. I start to lose confidence in my writing. I start to panic. I look at blogs written by my idol bloggers and see their comment count and go back to mine and feel failure setting in. I tweet my blog in earnest hoping more people will read. It becomes frantic. It really is madness. This feeling lasts for a couple of hours. After a while I pull myself together and let it go. These feelings make me question why I write. Should I write for me or should I write for others? I find this question difficult to answer. In the first instance I believe I should write for me. I should write because I enjoy it. Because it makes my heart sing. I enjoy crafting a sentence. I enjoy taking thoughts from my head and putting them onto the screen. I enjoy reading them back. I enjoy changing the words around. I enjoy writing. This is a good thing. Would I enjoy writing if no one ever read my writing? I'm not sure I would. Like any artist, I like people to view my craft. It is human nature. Am I an artist yet? Would I say I'm a writer yet? Not yet. I'm still working on it. Prior to blogging, the majority of writing I have done has been angsty writing. The type of stuff you write when your heart is breaking and when you need to understand your feelings. Private writing. Journal writing. In addition to writing for myself, I choose to write now because I do want others to read it. I want to share the things I think about. I want people to read what I have written and nod their head in agreement or even shake their heads in disagreement. I want my writing to make people reach back into the dark recesses of their minds and hearts and feel a kinship with me. I want them to sigh with relief that they are not the only person to feel the same way. I want to inspire people. I want them to smile. I want them to laugh. I want them to cry. I want my writing to move people. I really do. I have been lucky with my blog writing so far in that I've never had a negative comment nor a troll visit my blog. For this I am very grateful. I know that it is only a matter of time before they rear their ugly heads. Am I ready for them? I don't know. I think I will feel a sinking feeling in the pit of my stomach and I will momentarily question whether I want to keep blogging. I know that I will move on and keep writing. I've found my writing groove and I want to keep it going. Hear that trolls? You don't really scare me, but, I would appreciate you staying away. Thanks. So, now that I've shared my reasons for blogging and the crazy things I do to feed my ego after I've blogged, I would like to ask you, my lovely reader to share something with me. The very gorgeous A-M over at The House that A-M Built wrote a post this week where she asked her readers to say hi. To identify themselves so she knew just who was coming to her blog to read about her life and her house. I loved this idea for two reasons. Firstly, I would love to know just who stops by my blog. I'm nosy like that. And secondly, it's that ego thing - I'd like to get loads of comments. I'm being honest. 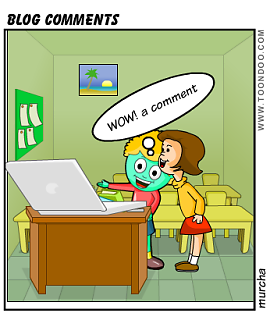 Us bloggers really do love comments. It is a buzz. So please, say hi and introduce yourself. Put a link to your blog in your comment and I'll make sure I come over and say Hi to you. Hi there!! Yep, comments are great aren't they?! I blog everyday (but not for the comments) - sometimes I too wonder what I could possibly say to interest people everyday - but then I remember that's not actually the point of my blog. Yes, the comments are nice; they make me feel like a part of a big friendly conversation, but my blog helps me to make the most of my busy life :-) And that's what makes me feel good!! I stop by. Regularly. Love your work! If you want you can check my site too (http://www.hilarioustv.co.uk/) with updated articles about comedy !